Your Growth is our Business. We are the leading TV media investor worldwide. As the investment arm of the ProSiebenSat.1 Group, we are the ideal partner for B2C growth companies, especially in the consumer goods, retail and service sectors that have the potential to achieve sustainable success through the use of TV advertising. Zalando is a great case to illustrate how companies can benefit from our media power and become market leaders within a short period of time. The combination of media power, capital and our operational know-how make SevenVentures the premier partner for international growth. At SevenVentures, we provide support for our portfolio companies within the ‘Media for Equity’ and ‘Media for Revenue’ investment models. Supplying you with the most effective advertising slots across various media services is the core value of our partnership approach. Advertising allows portfolio company products to be presented in a visually emotional way, which builds trust, improves brand awareness, and forms effective barriers to market entry, all building toward increased sales. We reach over 14m viewers daily across the seven free TV channels in our group, ProSieben, SAT.1, kabel eins, kabel eins Doku, sixx, ProSieben MAXX and SAT.1 Gold. In addition, through our group equity holdings in the digital and e-commerce sectors, we have access to a wide range of additional media platforms. Together with our many years of experience and a common understanding of your product, sector and competitors, we can create a highly customised media campaign and combine it with our specialised approach to monitor rejections and analyse results in order to provide you with the best possible support. In our capacity as leading TV media investors we directly invest our own resources, therefore we are not bound by traditional venture capital investment regulations such as minimum investment periods or specific levels of investment. This allows financing to be addressed with the necessary degree of flexibility. As a general rule, we only make capital investments combined with media power in select companies that are heading towards profitability. If there is a need for greater investment, we can call on our network of institutional investors and family offices, which can prepare larger investments. Furthermore, there is always the possibility that we will make a larger investment and acquire a strategic majority stake in the company. These investments are then passed on to our sister companies such as 7Commerce and 7Travel, which both hold the group’s strategic portfolio investments. Our media power and group synergies have decisive affects on the success stories of our clients. These synergies include digital expertise, cross-marketing campaigns with other e-commerce platforms or online/performance marketing, support with know-how in the creation and production of TV spots through our in-house agency or in cooperation with external partners, as well as algorithmic analysis and tracking of TV spots. A solid partnership on fields such as media planning and 360° TV campaigns enhance the success opportunities of product placement, sponsorship and other advertorials strategies. SevenVentures is the ideal partner for companies that have identified Germany as their next growth market or are wishing to expand their business from Germany into other European countries. We support our portfolio companies in every aspect. Europe is one the most attractive global markets, with enormous potential to promote diversified business models. Market entry must be quick and perfectly organized in today’s “winner take all” ecosystem. We can provide our partners with assistance in any operational and regulatory aspect, because we can call on the full range of synergies attributed to the ProSiebenSat.1 Group, as well as a wide network of renowned manufacturers and retailers. A strong and experienced team of local advisors on the ground will accompany the process of market entry. Offering their advice and their support along the way. 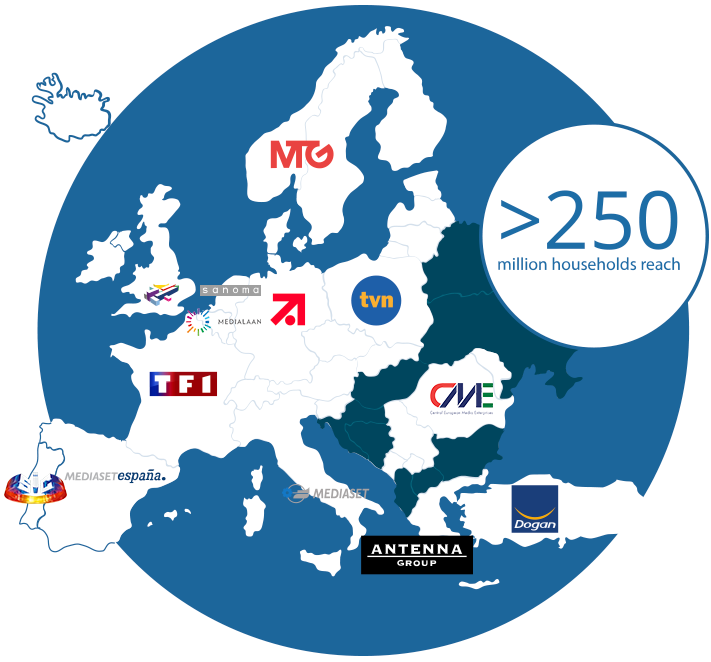 The European Media Alliance was initiated in 2014 as a media network of leading European TV broadcasters. This allows geographical coverage and investment opportunities in the digital arena to be expanded significantly. The alliance consists of twelve members covering most of Europe, and, along with ProSiebenSat.1, also includes TF1 (France), Channel 4 (UK), Modern Times Group (Scandinavia, CEE and Africa), TVN (Poland), Dogan (Turkey), Antenna Group (South-East Europe), Sanomna (Netherlands) and Mediaset (Italy and Spain).